Post-op cold leg/foot, pins and needles - advice?! Had an arthroscopy 7 weeks ago which diagnosed advanced patellofemoral arthritis. Over the last week or so, I am having increased problems with a very cold lower leg and foot, pins and needles and hyper-sensitivity of my skin in the same area (including my knee). I just can't seem to get it warm, and it gets worse as I go through the evening. I'm wearing thick socks and warm joggers, and a warm jumper (! ), but it doesn't seem to make much difference. I've even got out my heated blanket and have wrapped my lower legs in that. I can't wallow in a nice warm bath yet because I'm not yet able to get out safely. It's a nightmare trying to get comfortable in bed, and my husband is getting fed up (ie shrieks like a girl!) with me wanting to warm my ice blocks up on him. I do usually have fairly cold feet, but never like this. I keep wiggling my toes and ankles to keep the circulation going, but I am worried about it. I know it's not uncommon to have this sort of problem after surgery, but any hints and tips would be gratefully appreciated. 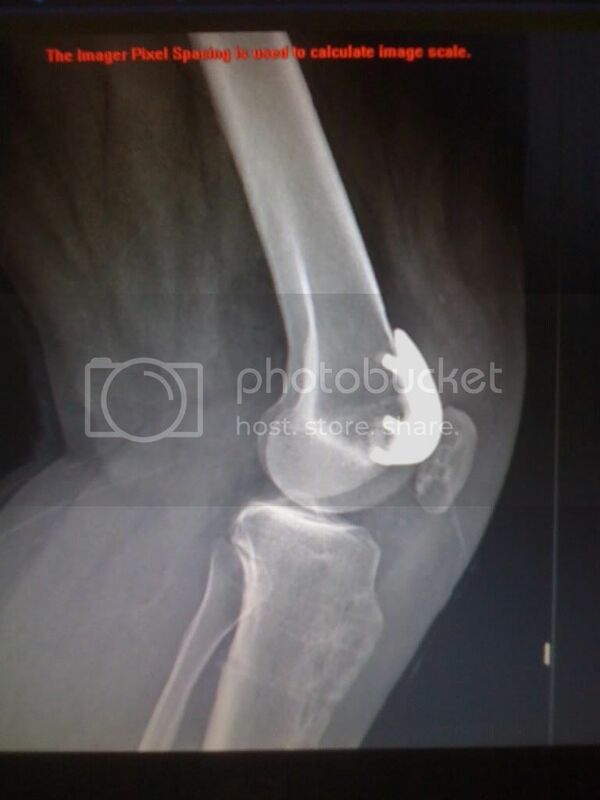 Dec 2011 - MRI R knee, PFOA is worse than L! Re: Post-op cold leg/foot, pins and needles - advice?! I have to chuckle at you warming your feet on your husband it sounds very familiar. I have see battery operated warmer socks in magazines. Sorry not sure which one but they might feel good. My feet are always cold which is why my knee is in the shape it is. I was chasing my cat in my socks on the tile kitchen floor. I slipped broke my knows this required 8 stitches and as it turns out tore up my knee and am new working on my third surgery this year. Thanks for the tip on the socks, I'll have a look. Reminds me as well that there are warmed ones designed for arctic explorers (or similar - don't quote me!). I'll see what the good old web has to offer. I'm intrigued though - why you were chasing your cat across the kitchen floor in your socks?! Are you having any changes un the color/texture od the skin in the area that is hypersensitive to touch? Any sensitivity to ice in that area? I was trying to put him outside for the night otherwise he wakes us at 3am and insists on going out then. He won that night. I was also thinking my husband works with the military and he asks me to send those hand warmer things that hunters use. You should be able to at any sporting goods store or website. Laurie - we've got one of those as well. He hides under my daughters bed so my husband doesn't see him when he checks before we go up, then appears on the landing in the wee small hours, miaowing VERY loudly! They are funny things... Thanks for the tip on the warmers. Hi KW, thanks for replying. No general change to the skin. If I am on my feet for too long (longer than about 20 minutes) my knee swells quite a bit, and when it gets like that my knee goes quite purple and develops delightful orange blotches. It's been like that since the op, but that goes once my knee is rested and elevated. Other than that, I think the general skin tone is pretty healthy. The skin on my shin is definitely looking a bit thin and papery (I'm 40) compared to the other, but I think that's down to the significant muscle wastage on that leg. I've been careful not to overdo it with the ice, having suffered from some neurological symptoms in that leg for the last few years anyway, so I only tend to use it for short periods, and never have direct contact or leave it in one place for more than a few minutes. I haven't iced my knee at all the last couple of days because I've been having these unpleasant sensations, to see if that would reduce it. I wouldn't have negatively connected the icing with the hyper-sensitivity so far, and putting the ice on my knee doesn't feel sensitive in that kind of way. The hypersensitivity comes from contact like clothing or bedding (toes, heels and knees), and seems to get worse through the evening, but it's not there all the time. Hope that makes some kind of sense! I would keep off the ice as you're doing and see how things go. If you're at all worried I would see if you can get a doctor to have a look. My surgeon was awesome, he spotted what was happening straight away after ruling out failed hardware, infection etc. Keep us posted, I am sure the poor leg is just feeling chilly and sad and not used at the moment, but keep monitoring things. It's not been as bad yesterday. I had my thermal socks on and my electric blanket over my lower legs which did seem to keep them warmer, although if I didn't have it on for a while it went cold again very quickly. My muscles in my calf, ankle and foot seem to be aching more though, even first thing this morning when I woke up - I noticed it more than the pain when I bent my knee! The sensitivity came on again yesterday evening and the skin looked a little redder over my kneecap around my main scar (I had two - one has healed very neatly, but the other over my kneecap is thicker and raised). When it comes on it is a painful prickling sensation. I did try massaging gently over it and it did feel strange. I wasn't really looking out for whether or not the massaging helped, but the sensitivity didn't last very long and it was ok when I went to bed. I haven't noticed the leg/knee sweating at all, only that the skin on my calf feels and looks older and thinner. What is RSD then? (don't worry I won't instantly imagine I've got it!). I'm finding it difficult to pinpoint anything right now! My back aches from all the sitting (I'm going to go back to alternating with lying flat for an hour in the afternoon), but I can't be upright for long before my knee becomes a big purply-orange 'OW', so I feel I can't win. I'm trying to do the calf stretches, ankle wiggles and leg bends, tightening of quads, and sitting on the gym ball for 5 minutes every hour moving things around, and I'm walking around for a few minutes regularly to keep things moving. But the more I do the worse the pain gets, and I feel stuck between that rock and hard place. My R knee is still joining in as well which is making stairs and the loo even less fun! I'm at 7 weeks post-op. Shouldn't the swelling be better by now? Mind you I had it before the op, so maybe that's just what the PFA is doing. I've ordered some Litozin and I'll start taking it next week. Fingers crossed for some improvement. I'm going to ask my hydro physio if I can have another session a week. Im worried that my R leg is starting to thin as well, and both my knees are looking very knobbly (unless I'm upright, then they're fat!). I know how important those leg muscles are and that feeling of instability really worries me. If my L knee went, would my R knee be able to stop me falling? Oh I don't know. I shall go and wash my hair (ow ) and find a cheerful thought! Thanks Lottie. Hope you have a good day yourself. Just after posting that the sensitivity came on! It was on my L knee, but not over the scar this time. Quite sudden, same as before, a painful prickling thing (ow, there it is again). I had my dressing gown over my knees, so I moved it off my knee and gave it a rub. It eased off a bit, but now I've stopped and put it back over it's back again. Now I can feel a little patch on my R knee and L shin as well! Better stop this or it'll be head to toe! Maybe I just need to move it more and find that optimum temperature. Time to get up and move! Just had same problem having only had micro fracture etc 3 weeks ago but slowly coming back. They said it could take a good few months before it all comes back due to the block used in the op and nerve damage. How ever if you are based in the UK? Get onto your occupational therapist who will organise you a bath lift free of charge. It really helps once you are in the bath for leg ciculation. Thanks for the advice and reassurance. I was looking at knee anatomy pics and it's amazing how many nerves go through the kneecap area, so I suppose it's no wonder things are taking a while to sort themselves out. Time to swallow my remaining pride and stop being a muppet about it all. I'll give my GP a ring and ask to see one. Good choice although I know how you feel about pride but at this pound it is about recovery not pride. It will all come in time or at least I keep telling myself that . Hope you enjoy a good bath soon. The bath thing is great. Its just a seat that you put in th bath, its run off a rechargeable battery. It lifts up to top of bath, you literally sit on side and then lower yourself down into bath, it's fab!! OT can also give you a frame which literally you put over wc and so you can hold handles and raise and lower yourself onto wc with no trouble, well worth it.